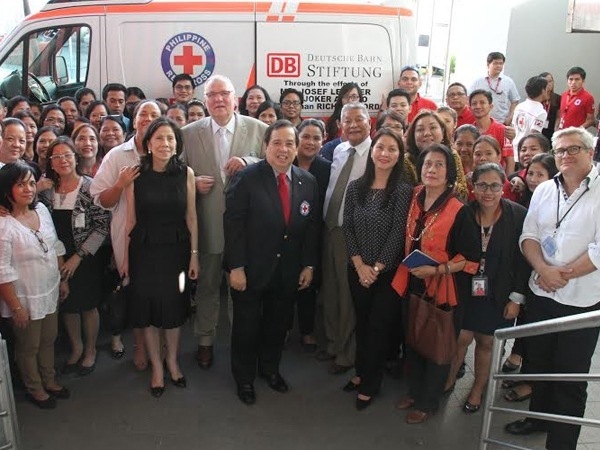 A new ambulance was added to the fleet of ambulances of the Philippine Red Cross (PRC) as DB Schenker Germany officially handed over their ambulance donation to the PRC on January 5, at the PRC Tower in Mandaluyong. The new ambulance brings to 119 the number of ambulances of the PRC nationwide. DB Schenker was represented by Josef Lederer, president of Public Affairs of DB Schenker Germany, who personally handed over the ambulance to PRC chairman Richard Gordon. The ambulance, a Mercedez Benz, arrived in the Philippines on October 20, 2015 and was received by representatives from the PRC and DB Schenker Philippines. “We are grateful to DB Schenker for this donation and would like to thank Mr. Lederer and the late Senator Joker Arroyo for choosing the Philippine Red Cross as recipient of this ambulance,” said PRC chairman Richard Gordon. Also present during the ceremonial handover of the ambulance were Atty. Felicitas Arroyo and Ms. Joker Arroyo, wife and daughter of the late Senator Arroyo; Daniel Puillet-Breton, Cooperation Coordinator of the International Committee of the Red Cross (ICRC), PRC Board of Governor Carissa Coscolluela, PRC Secretary General Gwendolyn Pang; and friends and staff of the PRC.